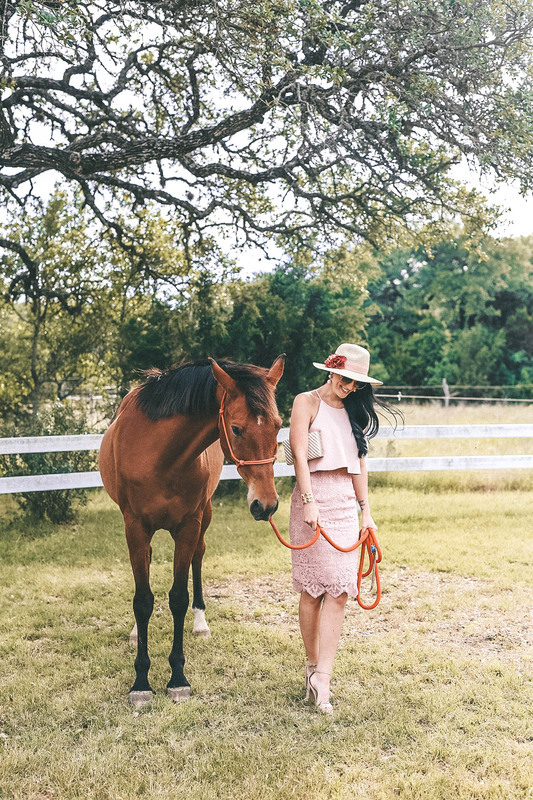 Summer is all about fun hats and beautiful dresses. 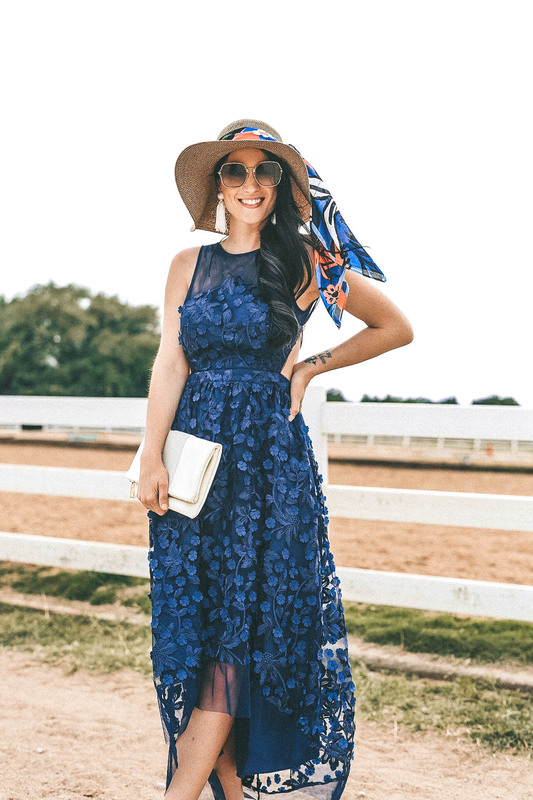 There is literally no better way to kick off your summer style than with the Kentucky Derby. 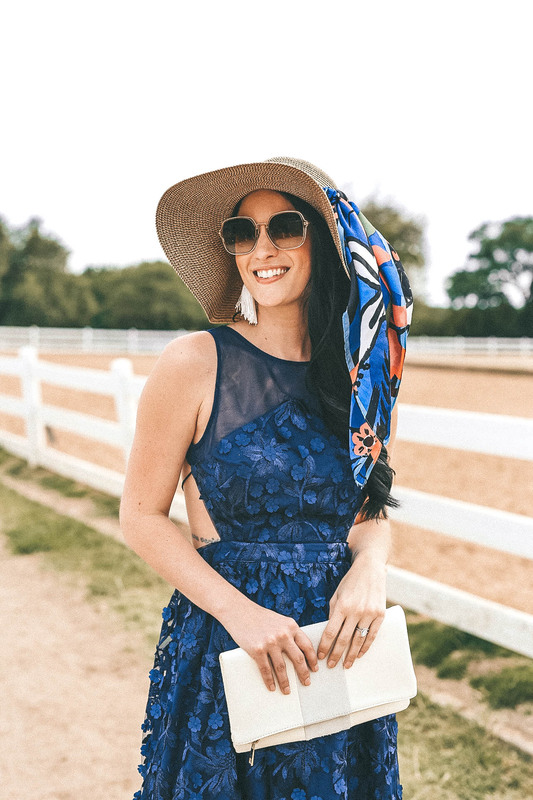 Whether you are planning to actually attend the Derby itself or just planning a fun soirée, I’ve got a few looks that are sure to turn heads. Not to mention they are extremely easy to recreate on a budget. So who out there is actually attending the Derby? One of these days I would love to be in the middle of the action but until then I will be glued to my TV watching all of the NBC updates! 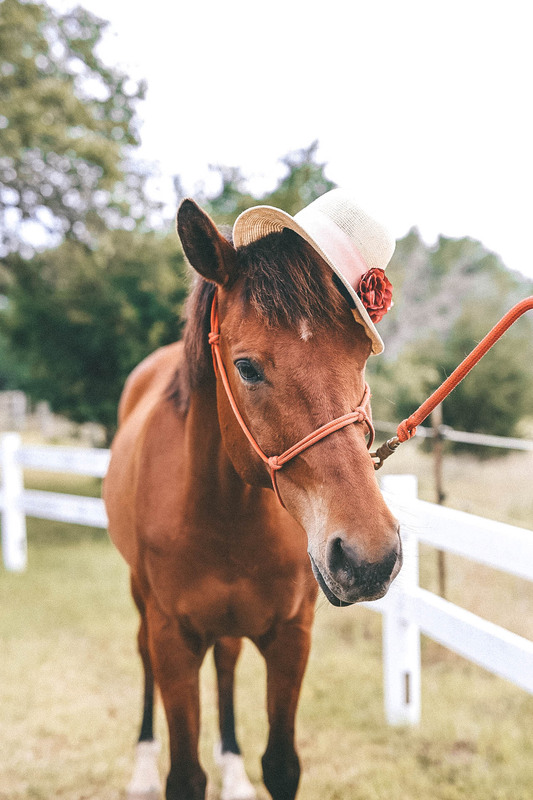 It’s not only the horses getting all of the attention; it’s the fashion! In true Kentucky Derby spirit I wanted to make my party looks as realistic as possible. My husband’s mom has a horse ranch out in Dripping Springs with about 65 horses. 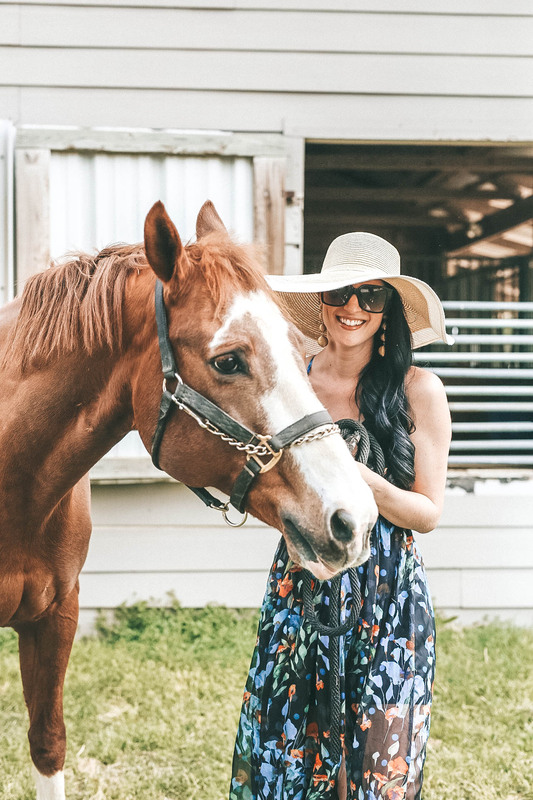 I immediately started planning out my Derby content and how I would incorporate some of the horses out there! 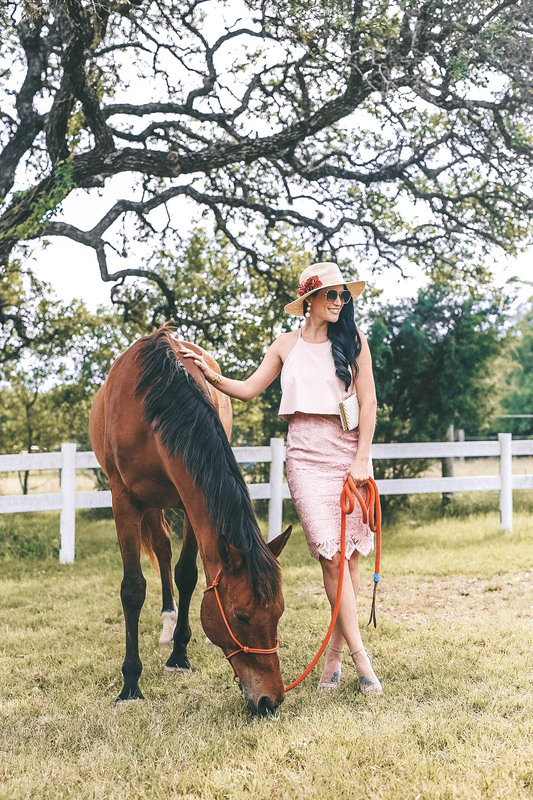 If you are familiar with the challenge of working with horses, or animals in general, you know that all of the long planning kind of goes out the window. 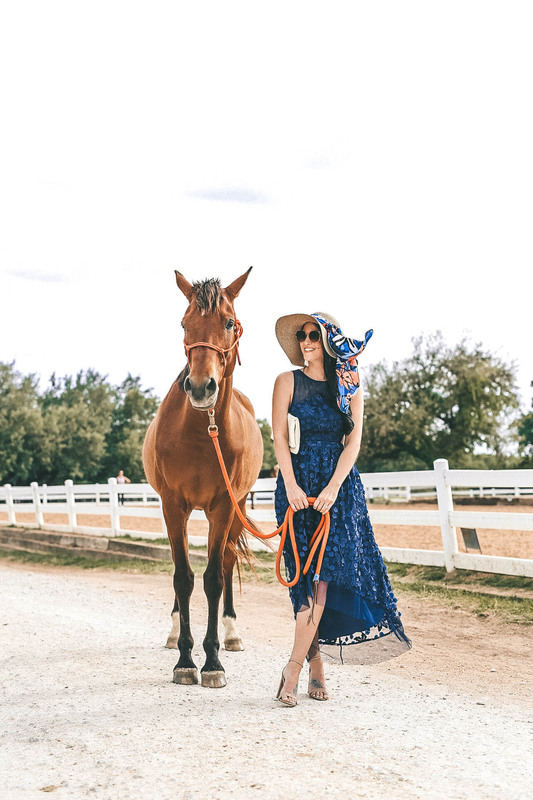 I had so many amazing ideas to get on a horse with a gorgeous maxi dress flowing in the wind… Reality check, horses really don’t like anything in their faces, such as a large floppy hat or anything that moves quickly, like a flowing maxi dress. 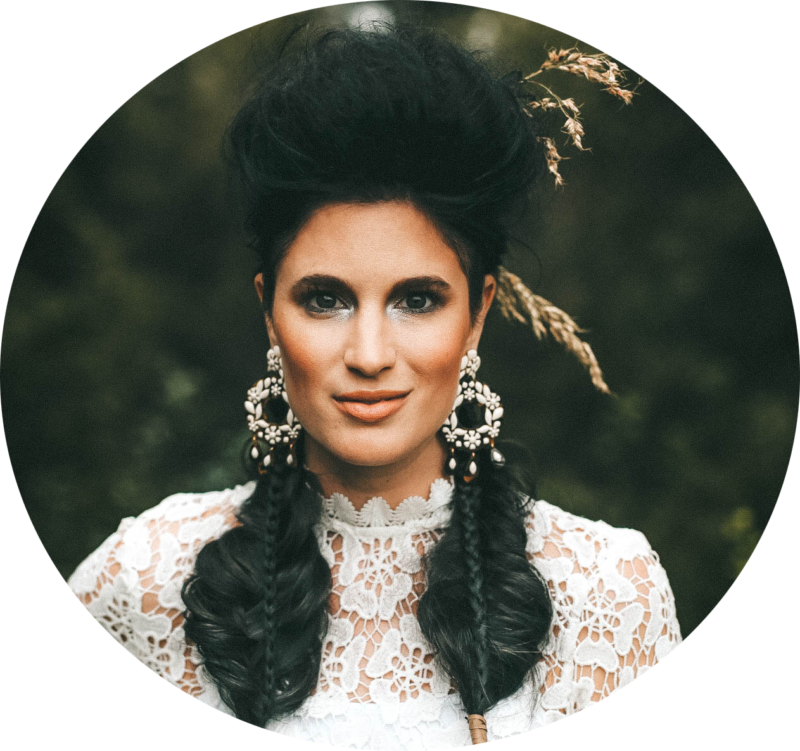 Thankfully, we made it all work and were able to shoot 3 full Derby looks that are easy to recreate. 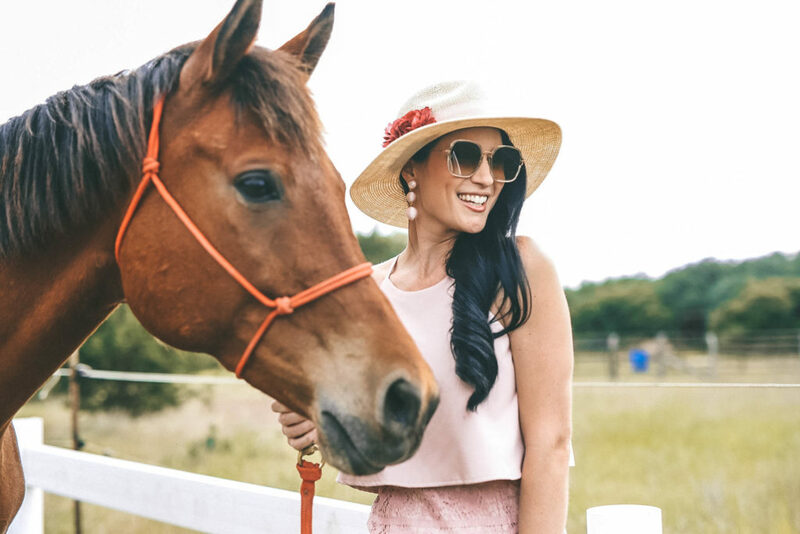 All 3 of these looks are perfect to if you’re wondering what to wear to a Kentucky Derby party. What I loved about these looks is that each look came from pieces already in my closet. As you’ll see, I didn’t go overboard with crazy hats but still made a subtle statement with each one. 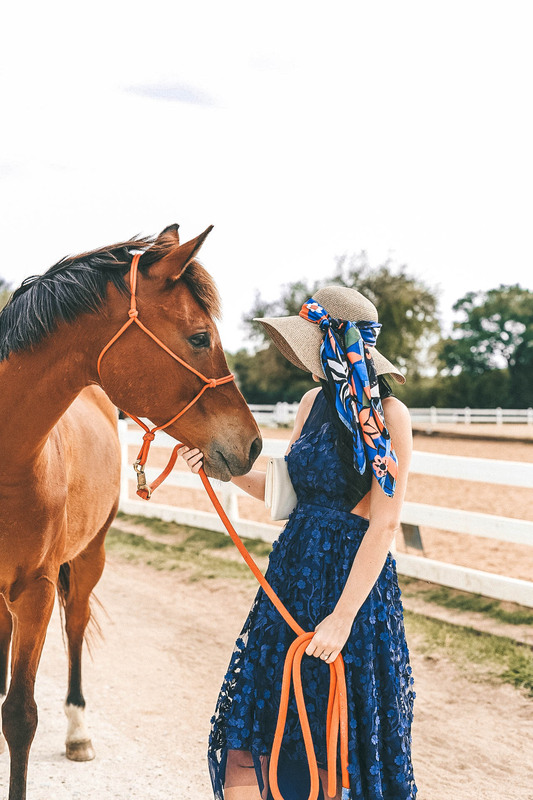 I’ve got some great tips if you are like me and have absolutely no idea what to do to create that perfect Derby hat. Grayson and I had planned to attend a Derby event but I literally had 0 hats that looked appropriate enough to fit in with everyone else’s fascinators. I can sure tell you that I have an overabundance of floppy hats. My creative juices started flowing and started throwing different pieces together to create the perfect Derby hat. The first look I opted for a basic straw, floppy hat. I wanted to keep it a little more subtle since the maxi dress has such a busy print with lots of colors. 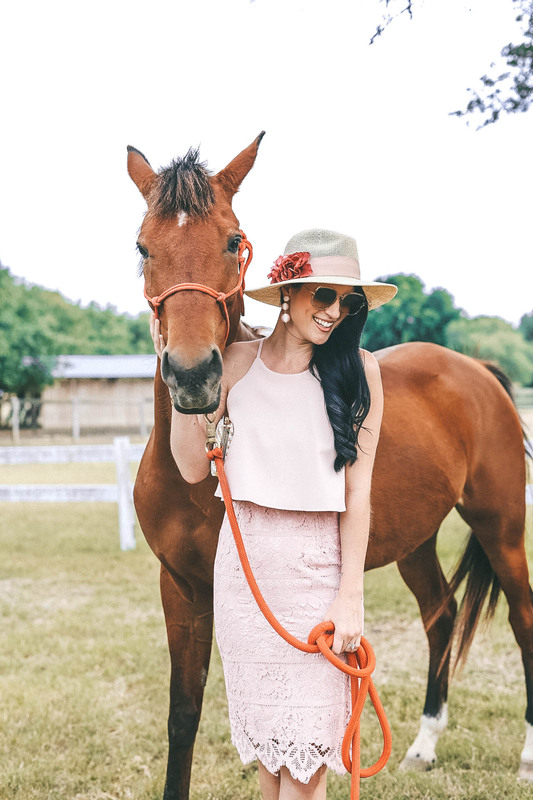 This second look is one of my absolute favorite Kentucky Derby inspired looks. Actually, these photos are my favorite out of EVERYTHING we shot! 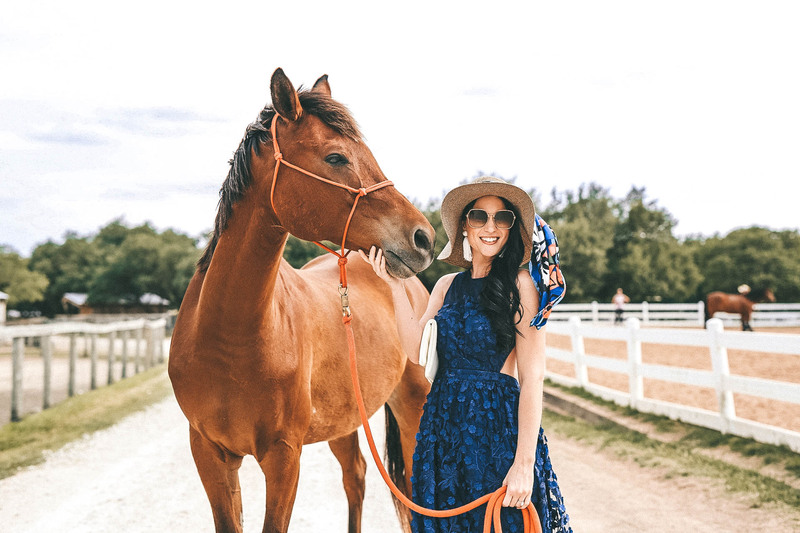 I just can’t get enough of the details on this dress and we took photos with a new horse, Koa! He was a gorgeous Arabian horse and was such a ham! Talk about the perfect animal model; he cooperated with everything we were having him do! This hat was another favorite of mine. I had a floppy hat lying around the house (surprise, surprise) and wanted to spice it up without having to go buy anything! I found a beautiful silk scarf and literally just tied it around the top. Last but not least, this gorgeous pink stunner from Chicwish. I actually ordered this dress in early April not knowing where I would even be wearing it but knew I had to have it. Then it hit me last week, this would be the PERFECT Derby dress! 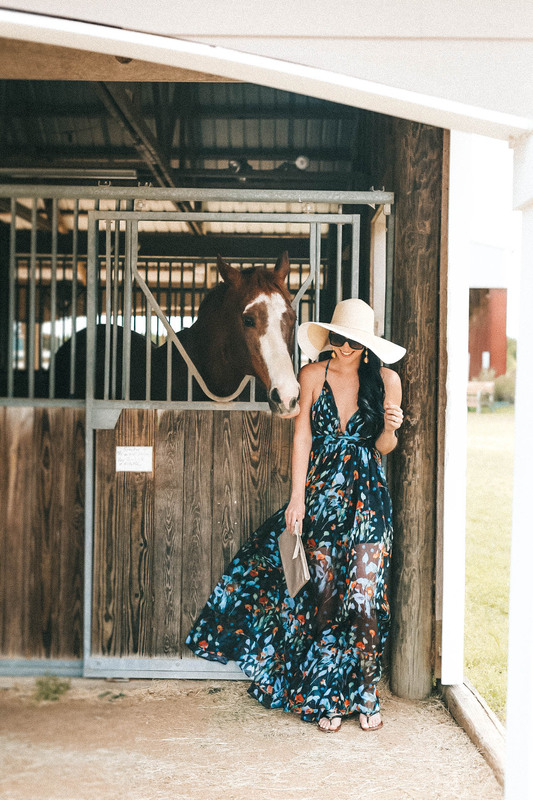 I don’t know what it is but everything about this dress gives me all the Kentucky Derby vibes. I even had this awesome hat to go with it. This hat is another extremely easy DIY project if you’re feeling creative. This is just a basic straw hat. It is a little more structured that your typical floppy hat if you’re out browsing for one. You can go buy faux flowers at your local Hobby Lobby or craft store and hot glue the little flowers on the hat. So easy and it looks professional! 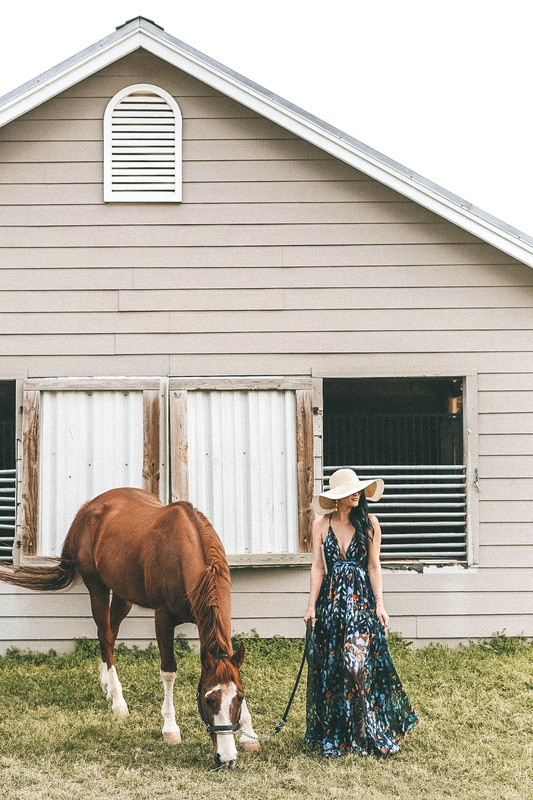 Now, you can’t say you have nothing to wear to a Kentucky Derby party! Each of these 3 looks are completely different styles of dresses with different styles of hats and accessories. 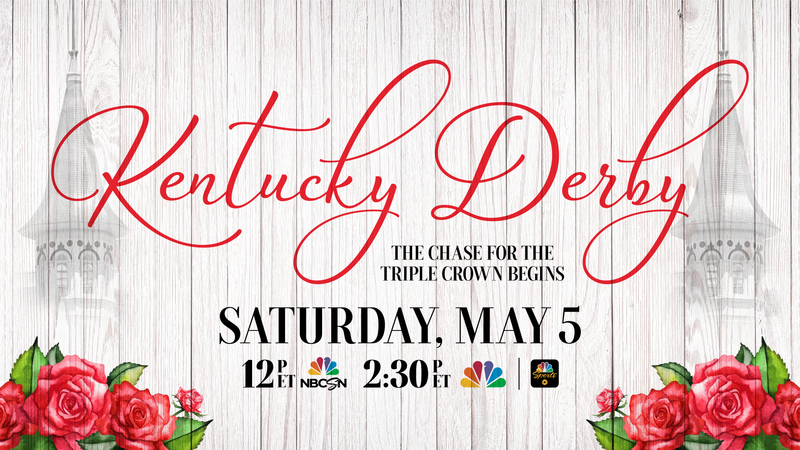 Don’t forget, the Kentucky Derby is May 5 on NBC! Keep an eye out, you might see a familiar face!! Oh my gosh! I LOVE all the outfits you selected. And your hats are perfect! I love all of these looks! I have a friend who is a chef at the Kentucky Derby and I tried to tag along! LOL! I have never been but I am definitely going next year!!! And I will be looking for you on the TV! all three of these looks are GORG! But I think my fav is either the maxi or the navy dress… so so chic! 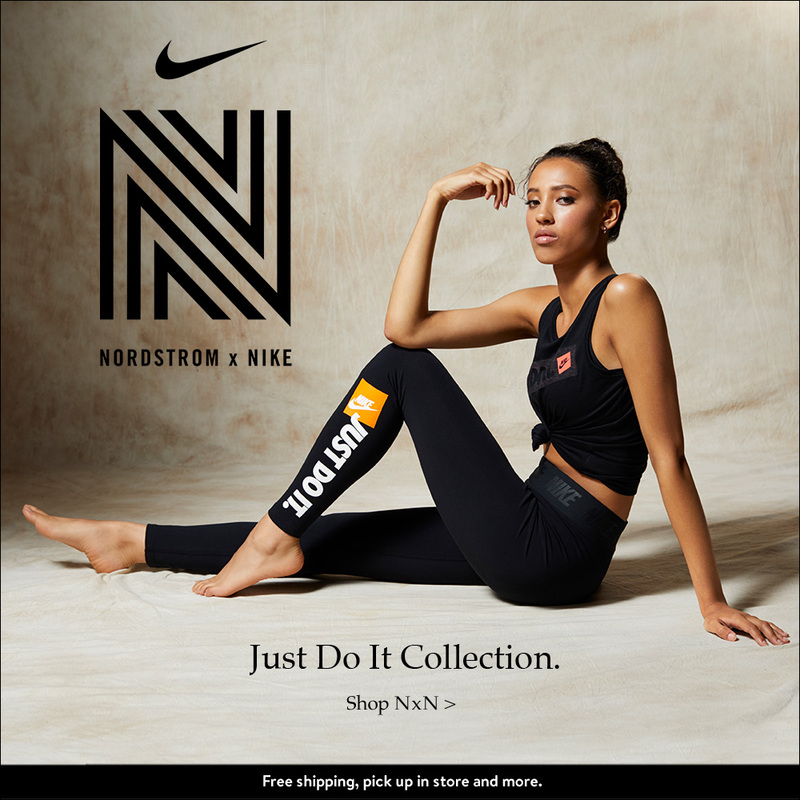 Oh my gosh all of these looks are so great! I haven’t been to a Kentucky Derby party in so long. 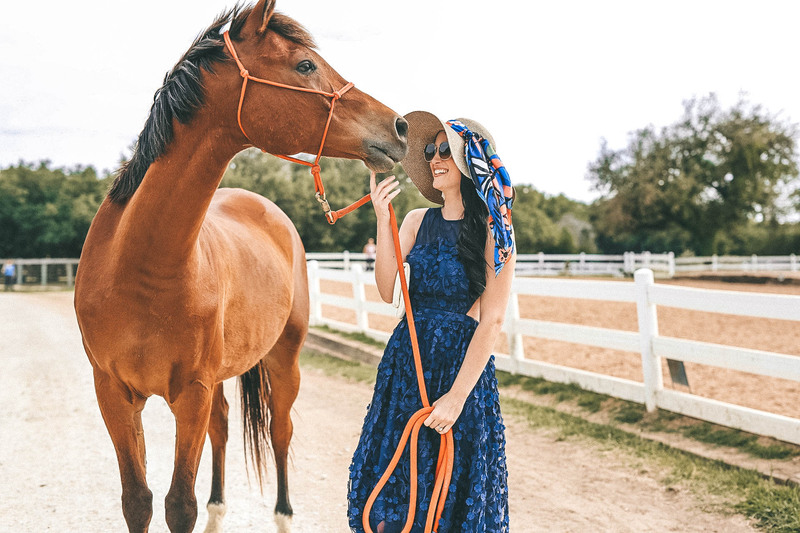 That middle blue dress is stunning, and I love the hat! Stunning as always! I love all these looks! 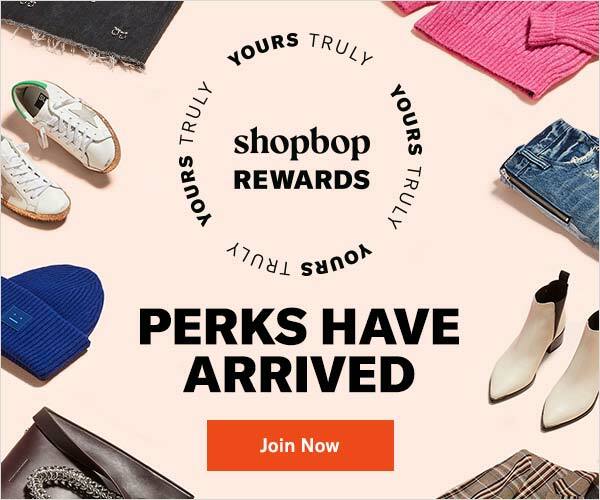 You look fabulous in all of them! So many cute outfits! I’m going to a party too, love your dresses!! ASHLEY!!!!! These ideas are so amazing & fun!!! I have a party to go to and now I know just what to wear! You are stunning in ALL of these!!! These are all great, but the last one is my favorite for sure! That long floral dress is STUNNING! Perfect for a derby party! All of them are so beautiful! I too would love to go to the Derby someday! I honestly love all your options, but that black floral maxi is probably what I’d go with .. love it!! All really great looks but honestly the first dress was it for me. These looks are just stunning. Giving me all the inspo. Oh my goodness they are all so pretty!!! Really hard to choose a favorite! I really love all these looks! I can’t pick a favorite – maybe, the pink one! Oh, and Koa is such a cutie! 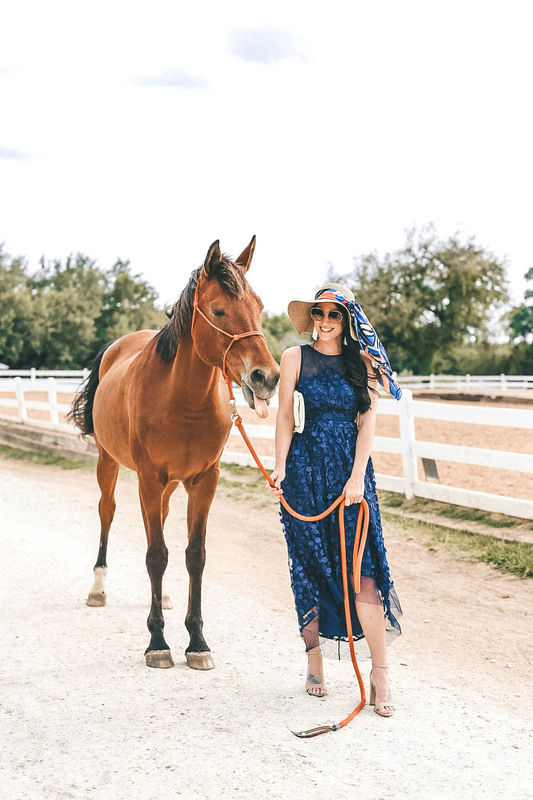 the maxi is definitely my favorite – so stunning! i was paper writing all weekend so no derby parties or cinco celebrations for this girl, boo! Girl, I wish I was as glam as you! These dresses are stunning. These dresses are SO beautiful! The first one though….. omg that is gorgeous! I’m so crazy for #2!!! You are stunning and this look is everything!